Peoples Democratic Party expresses deep concern at the continued freeze of peace process in the wake of terrorist atrocities in Mumbai and calls upon government of India to respond positively to the yearnings of peace and conflict resolution in South Asia. The Central Executive of the party notes with anguish the current diplomatic exchanges between the governments of India and Pakistan that convey the impression of a cold war and feels it could have a negative impact on the situation in and around Jammu & Kashmir. Along with an apparent hardening of postures the recurrence of ceasefire violations across LOC and international border and increased incidence of violent actions within the state create a recipe for a throwback to pre 2003 situation which needs to be prevented. J&K having been at the receiving end of situations like that is obviously looking at the scenario with an element of strong disapproval. 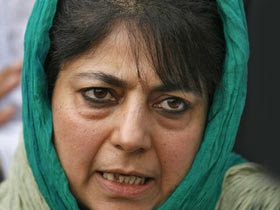 Rededicating itself to the cause of a permanent resolution of the issue of Jammu & Kashmir, the PDP feels there is no substitute to a process of structured dialogue that should be insulated against actions of the enemies of peace, individuals or groups. The party feels that the composite dialogue process between India and Pakistan should be restarted without delay to respond to the call of history. The party views with hope and a positive outlook the proposed initiative of the government of India to address the internal dimension of the issue of Jammu & Kashmir as articulated by the home minister of India. But the party is impelled to strike a note of caution. It feels that an honourable solution that satisfies people residing in all the three regions of the state should be the objective of this exercise and not mere dialogue to lead the participants to yet another dead end that has happened in the past. PDP calls upon the government of India to seek and ensure participation of all the major stake holders in the dialogue process which should be credible, sublime and result oriented. Peoples Democratic Party is deeply disturbed by the crisis of governance faced by the state for the last one year and calls upon the government to put its act together before it is too late. The Party Central Executive after discussing the situation that prevails in the state feels, with pain and concern, that the government led by the National Conference has failed in living up to even the bare minimum expectations of people. The government has let loose its instruments of suppression on the people instead of providing them an honest and efficient administration. The law and order situation is once again a cause of worry and the human rights disaster is only getting compounded with innocents losing life property and self respect. The party notes that the development works have at best become cosmetic exercises restricted to ribbon cutting and suffer from lack of perspective and supervision. In spite of receiving huge dozes of funds there is an unprecedented financial crunch with most schemes started by the previous coalition government being pushed to backburner. The government has been in almost a running battle with its employees for one reason or the other and most issues are being tackled on the streets and through force rather than on the table. PDP cautions the government against the increasing levels of alienation among the people as a result of its anti people policies, corruption and non governance. The disappearance of power, water and even food items from the government system for the last one year has not only thrown people into a vortex of miseries but has ominous portents for the politically volatile nature of the state. The people, who voted in the last elections against heavy odds and in great numbers had reposed their immense faith in the democratic system which the PDP feels has been grossly betrayed. Failure of the government to deliver could come at a heavy price to the confidence of the people which the PDP had helped repair with great effort after 2002, the party places on record with utmost regret.